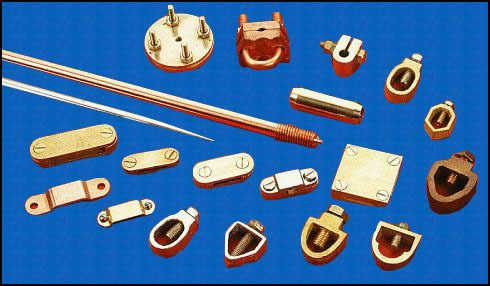 Internal Coupling Couplers in Brass Phosphorous Bronze or high tensile Brass dowel. Conex Copper bonded Earth Rods are packed individually in PVC tube bags and rods are fitted with blue caps at both the ends, thus preventing grounding rod threads getting damaged while handling. Hot dip galvanized rods and Galvanised accessories also available. Conex Earth Rods are made from high tensile-lo carbon steel complying with requirements of BS 4360 Grade 43 A. Each rod is molecularly bonded by 99.99% pure, high conductivity copper bondings, each rod is treated with Benzol-triozole derivatives. Threads on rods are formed by roll threading process, giving threads extra strength, eliminating risk of chipping the threads while driving the rods in the ground. Conex Solid copper earth rods are made in two types. Externally threaded and internally threaded. Solid Copper earth rods are used where the factor of corrosion is very high and exceptionally long life is required. Hence these rods are manufactured from pure and high conductivity hard drawn copper to BS 2874-C 101. These rods are also available with tin plating in order to reduce the risk of oxidation and increasing shelf life.